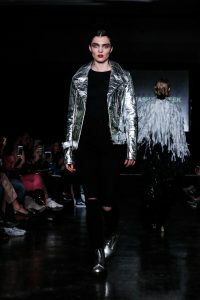 Vegan Fashion Week, a historic event dedicated to elevating ethical fashion globally, revealed its highly anticipated list of designers in exclusivity to attendees during its grand debut with a Vegan World at the Natural History Museum of Los Angeles, along with California Market Center in Downtown LA. Vegan Fashion Week invited like-minded designers and activists to the runway to showcase innovative, cruelty-free, sustainable designs. Designers included: Dr. Martens, Matea Benedetti, Noemie Devime, Altiir, Bayem, Ecopel, Enda, New Rock, Mink Shoes, Mistohn, Sarah Regensburger, Chloe Trujillo, Vegan Club and WastedLA among others. Vegan makeup was provided by Kat Von D Beauty and hair care products were provided by Giovanni Cosmetics. In attendance at the California Market Center were notable vegan advocates including Moby, Mena Suvari and Harley Quinn Smith. Upon arrival, attendees were treated to culinary innovations by French Naturaw Chef Marie-Sophie L, plant-based, vegan cocktails from Café Gratitude with FAIR, spirits, and a musical performance by harpist Naomi Greene prior to the runway show. Vegan Fashion Week is dedicated to elevating ethical fashion globally. This four-day event is designed to empower conscious brands and humans with an elevated platform for achievement, inspiration, and discovery. A tribute to the animals, and an ode to the end of animal exploitation in all forms, Vegan Fashion Week is produced and curated by French creative director and animal rights advocate, Emmanuelle Rienda, and merges fashion and activism with a deeply conscious twist. The post Inside The World’s First Ever ‘Vegan Fashion Week’ In Los Angeles appeared first on World Animal News.